What do you think of this new batch of NFL Draft players? Really? Im not a Bengals fan but AJ Green hasn't gotten a card since August. HE NEEDS A CARD!! No Deion Jones? That's a big sad for falcon fans. So it’s just first rounders and non first rounders? I thought they would go round by round. Is there new solos to get another 98? 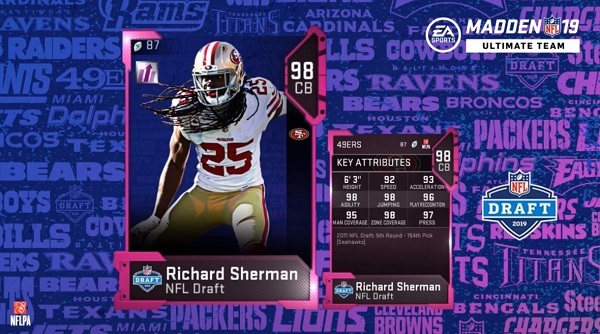 House rules this week gets ya another 98, doubt another NAT 98 cause it'll kill the Draft Master market. Looking forward to Ultimate Ticket telvin smith next month. Sort of new to ultimate team... just got my first 98 player... how do I get more 95+ players from solos.. So does JuJu not get another card? Or power up? More than worthy enough for a 98 draft card imo. Theres 10 teams with 2 or more cards in this promo at the same time as 7 teams have 0 cards? Sometimes i wonder if EA is run by the numbties doing the MDD streams. Considering how much money EA is losing and how much money they could make by just releasing players for more teams it doesn't make any sense? Titans need a receiver. All we have is Moss who is completely unaffordable. Then Corey Davis who doesn't even have a power-up, so we are stuck with him at 90. Give me a break. This is deffiently my last year we have players who havent had upgrades for months and then this morning they praise their develop team what a joke.